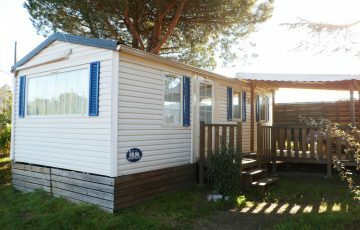 Well-known for its mobile home rentals and beautiful RV locations, the Les Pins-le-Congo campsite offers comfortably outfitted mobile homes where up to 7 people can stay.. These accommodations offer all the benefits of camping, but with the conveniences and comfort of home. No need to bring blankets, pillows, mattress covers, or dishes, because all that is included in the price of the rental. 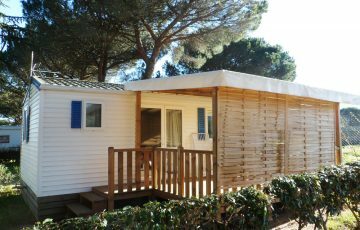 These spacious accommodations are all equipped with a fully equipped kitchenette for preparing meals, a living area with a TV, a shower room, and a covered terrace that includes a garden area for outdoor relaxation. 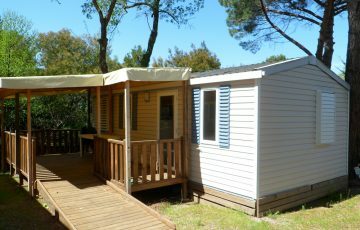 You can choose a model from among our 27 to 32 m2 mobile homes, based on how much space you need. For our camping friends, the restrooms with showers, sink, toilets, and changing stations are accessible all day long. Outside of July and August, visitors to the spas of Boulou and Amelie les Bains who book a 15-day stay can choose to extend their holiday by a week at no additional cost. Rentals are available for at least two nights (outside July and August) and empty pitches can be reserved for one or more nights. 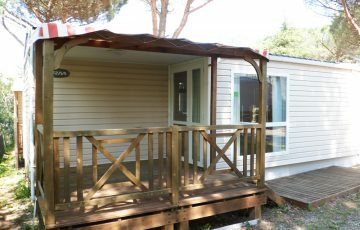 The four-star campsite at Maureillas is popular for the quality of its services, the availability of its staff, and the facilities it provides. It’s ideal for a relaxing time in nature, a wellness spa retreat, or to enjoy your favourite sports and explore the surrounding areas. 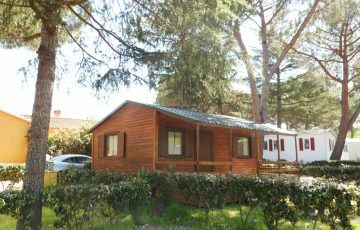 A perfect chance to discover the charms of the neighbouring towns, like Arles-sur-Tech (15 km), Castelnou (17 km), Argelès-sur-Mer (18 km), Saint-Cyprien and Perpignan (20-24 km). 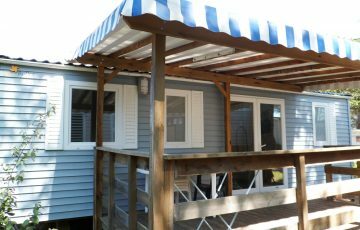 To ensure that you book the mobile home of the right model and size for your needs, we recommend booking several months in advance on our website. Rentals are furnished with pillows, blankets, and mattress covers. Do not sleep directly on the pads. The rental must be returned as clean as when you moved in. Animals may not be left alone in the rental. Any broken dishes must be replaced. When you leave, remember to clean the refrigerator and kitchenette (gas, dishes, microwave). Anyone who stays at the campsite must review its rules when they arrive and agree to follow them. Campers must be personally insured for all activities offered during their camping trip. No lifeguard on duty at the pool. Management is not liable for any injuries or property damage. Keep pets on a leash. Vaccination records are required.